It’s time for everyone in the family to connect all their mobile devices and video games to the 2018 Dodge Grand Caravan for the ultimate digital interactive experience. The driver will get help navigating the streets with the Garmin system delivering step-by-step directions to your desired location. Also, there is a 430 Radio system that connects to a high-resolution 6.5 touch screen for accessing your favorite songs. The DVD player will show movies on a large screen for everyone in the vehicle. When your favorite podcast is coming up, tune in with the SiriusXm radio. There is also a SiriusXM Travel Link for extra help on the road. The kids will have fun with their tablets because of the Wi-Fi connectivity and USB charging ports. Come to Village Dodge for a test drive today. 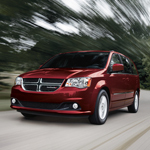 One of our salesman will guide you around the showroom featuring the 2008 Dodge Grand Caravan.